Vital Internet Security Alerts and Information for the everyday Non-technical Computer user, Internet User and Web Surfer who just wants to be safe doing basic stuff without the hassle of viruses, spyware, or worse. I'm very pleased that you're here today, and that you're concerned about your computer security and family Internet Safety. I look forward to your early return to the Security Alert Blog. Using the Web Feed or book-marking this page will make it a lot easier for you to visit again. Save This Page Blogroll Me! March 23, 2010 WiMAX Security - Is it secure? WiMAX may be old hat to a lot of Internet users, but there are some of us just getting onto the band wagon, so to speak. Because high speed wireless now provides broadband access over distances approaching 30 miles, and is available on more and more laptops and mobile devices, I was curious about what makes it work, and if the possibility of threats to our security were increased in proportion to the technical advances - like the gadgets we attach to our USB ports on our laptops. Seems as if WiMAX and EV-DO are the buzz words. If you want to know what they mean, my article on "Wireless Connectivity and Services" makes it a bit easier to understand. As far as the threats to our security, these networks are based on Internet Protocol and are subject to the vulnerabilities of any IP network. If you found our Security Alert Blog interesting, please subscribe to our RSS feed! March 12, 2010 Dozens of ZeuS Botnets Knocked Offline - for awhile. We recently discussed the ZeuS Botnets. 'Krebs on Secrity'* reported a few days ago that law enforcement and other security researchers may have been responsible for upwards of a 20 percent drop in the number of reported active ZeuS botnets. Some of these Bot networks are reported to have as many as 20,000 to 50,000 infected computers under their command and control. As far as it goes, this is good news, but the problem remains that the computers that were in those bot networks are still infected with the ZeuS Trojan horse that steals banking information by keystroke logging. The ZeuS Trojan is difficult to detect and not all 'anti- protection' software will find and remove it, although installing anti-virus software and keeping it up-to-date can reduce the likelihood of a ZeuS infection by 23%. Zeus is a financial malware. It infects consumer PCs, waits for them to log onto a list of targeted banks and financial institutions, and then steals their credentials and sends this information to a remote server in real time. Additionally, it may inject a code into the pages rendered by your browser, so that its own content is displayed together (or instead of) the genuine pages from the banks web server. Thus, it is able to ask a user to divulge more personal information, such as payment card number and PIN, and one time passwords, etc. In an Update on Mar. 11, 2010, Zeustracker reported that more than 40 ZeuS Command and Control servers are back online! That's not good news. Do a search for "How to Remove the ZeuS Trojan" and you'll probably not find an easy way to clean up your computer if it's infected. My belief is that the best way to fully recover is to take your machine to a professional computer service technician. Business Week review makes this Mystery type thriller by Joseph Menn very interesting, especially if you are even slightly concerned about protecting your assets from online crooks. The story takes place in Russia, where the misguided antics of a young computer nerd sets the stage for "How to Hack into computers anywhere in the world and Blackmail for Money", and "How organized Russian Crime Lords added this young hacker to their family of mobsters"
While many such cyber-crooks evade capture and incarceration - British and Russian investigators eventually brought these crooks to justice - in the book. "Menn's real achievement is that he entertains as he educates. One reason cybercrime persists is that it's too unfathomable to the general public to generate much angerdespite the fact that experts think it could be costing that public as much as $1 trillion a year. Readers may not follow every keystroke of Menn's story, but they'll retain enough to get scared." February 25, 2010 More on the Kneber/Zeus botnet. Will AntiVirus software protect my computer from this Kneber/Zeus botnet, and what does the name mean? Kneber is simply a name that Netwitness gave to a variant of Zbot (also called Zeus.) It is not new. Sunbelt Software Company's detections for some of the earliest variants date back to late 2006. The question has been asked, will VIPRE protect me against Kneber? VIPRE detections for Zbot/Zeus/Kneber have been in place for some time at Sunbelt Software Co.. VIPRE has been rated among the top in the AV industry. Over the past few days I have read a lot of media discussions and blog postings about the Kneber group of organized internet criminals and their Zeus botnets. Much of this has been presented in technical jargon, probably boggling the minds of the average home and small business computer users. There have even been some hints of in-fighting among the Antivirus software providers as to the seriousness of the current Zeus created botnet under the command and control of the Kneber group. As ordinary computer users and web surfers, this type of news should have a major impact on our approach to protecting our computers from Trojan intervention. Maybe we aren't the main targets - larger businesses and corporations appear to be - but if we don't take the threats seriously, and make every effort to keep our anti-malware software current, we could well be unsuspecting accomplices of the botnet farmers. If you use your laptop for work and personal stuff, if you save files and read your flash drives at work and at home, you could be part of the problem. And even with recently updated anti-malware, you are susceptible to infection by a virus released after your latest update. What's my point? Nearly every user who goes online knows 'what to do', but they have to be really serious about keeping their anti-malware protection up-to-date. "With Valentine's Day just a few heart beats away, millions of e-cards and messages will be flying through the Internet. But these low cost, eco-friendly expressions of affection can expose your home computer to security threats. Internet security software distributor AVG (AU/NZ) warns that criminals are using this increasingly popular medium to deliver viruses and other malware to the computers of their unsuspecting victims. Because risky e-cards are typically made to look like they have been sent from a trusted friend, they fool the recipient into opening them". Lloyd Borrett, Marketing Manager of AVG (AU/NZ), said. "Most people will automatically open an e-card if it's from a friend or colleague. To protect yourself from unwanted attention from cyberspace be very careful what e-cards you open and what you forward on." "While receiving an anonymous card from a Valentine can be exciting, opening an anonymous email with 'I Love You' in the subject line could be courting disaster. Don't let some nasty piece of malware worm its way into the heart of your computer." January 30, 2010 Protecting yourself from "Net Threats"
Just about everything we do these days seems to involve the computer and the Internet. Our mails, family contacts, children's pictures, flight reservations, medical records, work documents, and financial records have found their way into the world wide web of information. Making our lives easier through the use of the Internet has also made us more vulnerable to the miscreants, racketeers, and cyber-criminals of the world. Identity Theft and Harrassment are some of felonies and misdemeanors that any Internet user could be a victim of. Now more than ever, we need to protect ourselves and our family from these potential attacks. Here are some tips for your Internet security. None of this should really be new - and probably isn't if you have made any attempt at all to protect your computer - and family. But these are good reminders, anyway. Learn as much as you can about the Internet. Books, magazines and, of course, the Internet offer a lot of information about Internet security through websites like this one. January 23, 2010 Do You Know How to Recover from a Software Crash? We have a lot of software on our computers today. Everyone should know how to take care of their computer as well as manage the hidden dangers and avoid the risks of a crash. Understanding the meaning of these terms will help understand this post. 1. Crash - When a program or your entire computer stops working and you cannot move the mouse or use the keyboard, and the screen is frozen. 2. Reboot - When you restart your computer after a crash. 3. Control Panel - A feature of Windows that will give you access to system utilities and settings. OK, so what should you do first if your computer crashes? Try to STOP and do nothing for a few minutes. Often, the computer is trying to do your commands and might just need a little more time to complete them. Pressing more keys could add to the computer's problems, maybe even forcing a crash. Check your connections for the keyboard and make sure the pins are not bent. Maybe there is a jammed key on the keyboard, maybe some liquid has spilled. Check the computer connections as well. Also, the mouse may just be dirty and need the inner ball that rolls cleaned with soapy water. Dry it and remove any dust in the mouse body itself and replace the mouse roller ball. January 8, 2010 Are you responding to out-of-date security advice? "Yesterday's advice" is still valid - Don't click on links in emails from strangers, Keep you Operating systems up to date, have current antivirus and firewalls software, etc. But Mr. Grimes points out that this advice falls short because it does not teach web surfers that they are likely to be infected by Web sites they trust and visit every day. - Further, it does not tell them that the majority of the malware threats they will be exposed to is from very official-looking Web warnings that trick them into installing software they shouldn't. - Does not tell them that official patches don't come in e-mail. 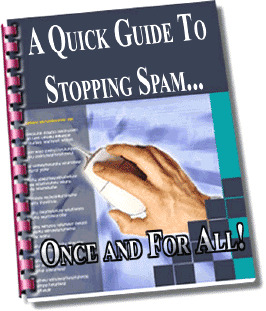 - Does not demonstrate how to distinguish between a fake anti-virus warning and a real one. - Does not tell them that they can be infected by Adobe PDF, Microsoft Office, and Macromedia Flash graphic files. - Does not tell them about spearphishing, where the phishing attacker knows their name and the e-mail appears to come from someone inside the company and references a product or group the user is involved in. - Does not tell them that the top search results from their favorite search engine often brings back legitimate-looking, but very malicious Web sites. We can't agree more with this, and even if we've heard it all before, there's a lot of good to be said for presenting these reminders. ... but also for all of the citizens of the world who are ruled in tyranny, who may lack habitable shelter, healthy and sustaining food, disease free water, opportunities to be educated and better themselves, a chance to live as free human beings. Here's the latest word I found on Free Anti-virus software. It's the result of tests reported by Charles P. Jefferies, NotebookReview.com Contributor on four free products. They report all are good, and rank them as follows. I use two of them(*) on my computers and am absolutely satisfied with their performance. Evergreen Free report - "Avoiding Current Security Threats"
There are still some unresolved issues with the Conficker worm and Cyber criminals are flooding the Internet with bogus "Anti Virus and Anti Spyware" programs designed to steal your personal information, add your computers to world wide "botnets", and generally prey on unsuspecting web surfers with unprotected computers. But you can take steps to avoid these security threats, and I have outlined them in a special report you can have for Free. This report is an update and a bit of an overview of the information published in my newsletters, blog and websites. It covers the basics of what to look for and how to prepare your computer to avoid the next high risk threat. It's a quick download (PDF file) which you can obtain by going to the registration page and leaving your email address so that the download instructions can be sent to your email inbox. Get Free Report here and share this web address with your friends so the emails you get from them are clean and free of malware. If you found our Security Alert Blog interesting, please subscribe to the RSS feed! Get the Family and Business fun stuff widget and many other great free widgets at Widgetbox! If you don't have your Virus Protection program yet, here's an Emergency Step you should take, Right Now! It has grown in size a little over the past few years and no longer fits on a single floppy Disk. But so many of the newer PCs, including lap tops don't have a "A" floppy drive anyway, you should burn it to a CD or memory stick for an offline back up tool. You can use it as we do, to check any of your PC computers for viruses, without being on line. It is an 'After the Fact' application, which means that it does not scan incoming email files, attachments or downloads, but it does scan whatever you have already received online. all my followers will find useful. 90 Percent of PCs are infected with Spyware - IS YOURS? 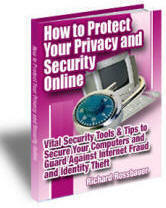 Checkout the eBook "How to Protect Your Privacy and Security Online"